Half-a-dozen enthusiastic recorders visited the former opencast mining site at Blindwells, near Tranent, East Lothian, on 29th August 2009. 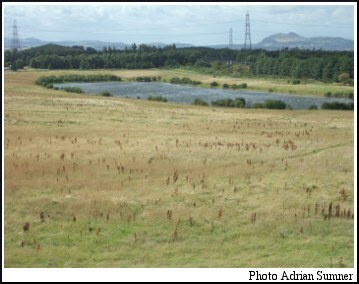 This site has been proposed for a new town, and is also on the course of a planned gas pipeline, so it seemed a good idea to find out exactly what wildlife was there, especially as rarities such as the Red-veined Darter (a dragonfly) and Five-spot Burnet Moth had already been reported. Although the weather was fine all day, there was a very strong wind, which no doubt inhibited many insects from flying. Nevertheless, we did spot several species of butterfly and some hoverflies. 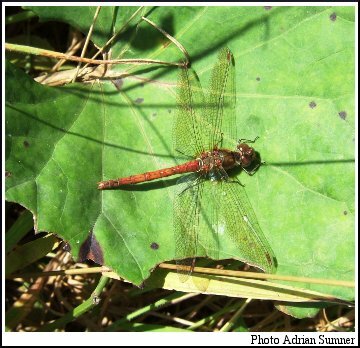 However, the most exciting finds on the site were the dragonflies and damselflies down by the lake which has formed at the north-west corner of the site. Common Darters, Sympetrum striolatum were indeed common, not only here but spreading widely across this very large site, but the real star was a huge male Common Hawker, Aeshna juncea. 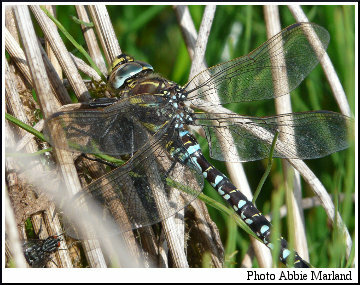 There were three species of damselfly: Common Blue, Blue-tailed, and Emerald. Some parts of Blindwells have been sown with clover, and one area had even been cut for hay by an adjacent farmer, but mostly the vegetation was fairly typical of a ruderal site, in this case a poorly drained one. Except round the lake, where willows were growing up, and in the north-west corner where there was some scrub and planted bushes and trees, all the growth was herbaceous. Of particular interest were the Marsh Cinquefoil Potentilla palustris, growing in one of the boggy areas, and a patch of Common Centaury Centaurium erythraea, apparently a recent colonist of some bare ground. There were some Dabchicks and a family of Coot, as well as a pair of Mute Swans on the lake, and the open uncultivated ground was evidently attractive to Meadow Pipits and Skylarks, as well as a Wheatear. A Kestrel (or perhaps more than one) was seen hovering overhead from time to time, and there was a flock of Curlew on one of the more cultivated areas. Most exciting, however, were parties of Snipe, which we unexpectedly flushed from some of the many boggy bits, and flew zig-zagging away. One member of the party was lucky enough to see a Rabbit being chased by a Stoat, and there was evidence, in the form of hoofprints, of Roe Deer coming down to the lake to drink. Although the total number of species was not particularly high, the lake shore was undoubtedly a hotspot for dragonflies and damselflies, and the wide open spaces of the rest of the site were evidently attractive to birds that like � well, wide open spaces!